As you guys are adding notifications for when a Egg hatches. Why not also add a notification for when Booster and Flash deals appear. It would surely increas the sales and help players that tend to miss them. 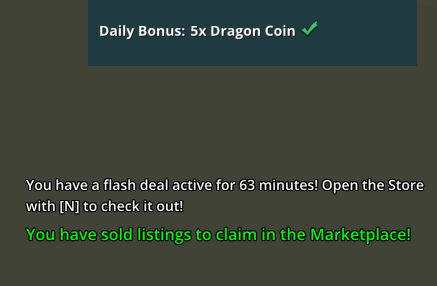 Why not also add a notification for when Booster and Flash deals appear. I had one earlier today for a flash deal, white text in the bottom right corner when I logged in. Looks like it's still going... The Sold listings/flash deals doesn't pop up every time you change worlds like the hatchery does in chat. Is this PTS or Live? I wish it would pop up every time you swapped worlds. Oh sorry, thats on PTS.